Complete product line: 10/12/20 points basic module, analog input/output, temperature input, relay or transistor outputs is optional. • Max expansion 44 digital I/O points, including 3 sets of 8 points (4 inputs / 4 outputs) expansion modules, 1 set analog input module, 1 set temperature input module, 2 set analog output module (2 channel current or voltage output) and 1 set communication module. • Analog input can expand to 8 points in which 4 points are 10 bits voltage/current input (0-10V / 4-20mA), temperature input can expand to 4 points (PT-100). • Several communication expansion modules are available: Profibus-DP, Devicenet, Modbus RTU, Ethernet (TCP/IP). • Built-in 16×4 LCD display and seven languages: English, French, Spanish, Italian, German, Portuguese and Simplified Chinese are selectable. • Ladder format, max 300 lines, 4 instructions per line. FBD format, max 260 blocks. • High speed counter input (1KHz) and pulse output are available. 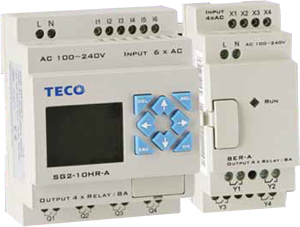 • Built-in 31 multi-function timers, 31 sets of counter, 31 RTC comparators and 126 auxiliary, 31 analog compare. • Lower price variant models without LCD Keypad and without top cover are available if order amounts reach TECO minimum production requirement. • Basic module (V type) built-in Modbus port (RTU), 8 channel I/O link and Remote I/O communication port. • Built-in RTC (setting Summer/winter time change) will be operational up to 240 hours after power off. • Relay output contact rating max 8A / Transistor output rating max 0.5A. • Two possible levels (A,B) can set 16 bits password protection function. • 2 PWM outputs are available. One can be used as PLSY (pulse output) at 1KHZ.